Today the sun is shining and there is a bit of a wind. It's super dry and we sure could use some rain, there seems to be a lot of forest fires flaring up around the province. On Tuesday night I went golfing with my husband, I didn't golf I road around in the golf cart and watched him golf as I'm still on crutches. While we were out on the course a water bomber flew over a couple times and fairly low. They are forecasting rain and I hope we get some to help fire fighter with their jobs. We never had very much snow over the winter so now we are suffering the dryness in the spring. 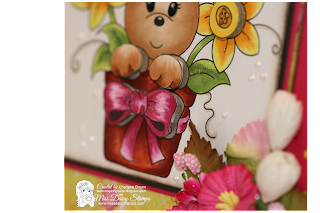 I made this super cute card using a fantastic image from Miss Daisy Stamps. This image is called Flower Pot Bunny and was wonderful to work with. I used bright fun spring colors and added some wonderful flowers to welcome in spring. I added a border of paw prints to add the bunny effect. This image comes complete with a bonus file of sentiments as well. Hop over to Miss Daisy Stamps and check out her wonderful digital images. To add some extra dimension to my card I printed to images the same size then grayed out the bottom image pieces that I wanted to pop up. Of course I love sparkle so I added a little shine on the card by adding some stickles. 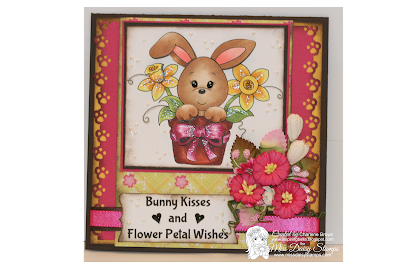 Thank you for hopping by and hope you stop by next week to check out my most recent Miss Daisy Inspirational card. Have a Fantastic sunny day!